As the church building of the new millennium for the Archdiocese of Newark, this architectural expression intends to honor the evolution of the nearly two thousand year old liturgical and building heritage of the Church, respond to the context of suburban New Jersey, and anticipate the challenges of the unfolding of God’s mystery in everyday life. The entrance plaza has been designed with a loggia to welcome worshippers, providing them with transient shelter from rain and sun while their individual paths are converged for a singular, chosen purpose. The plaza, bordered by the loggia, is visible from the street and all parking areas and includes a place for the Easter Vigil fire. 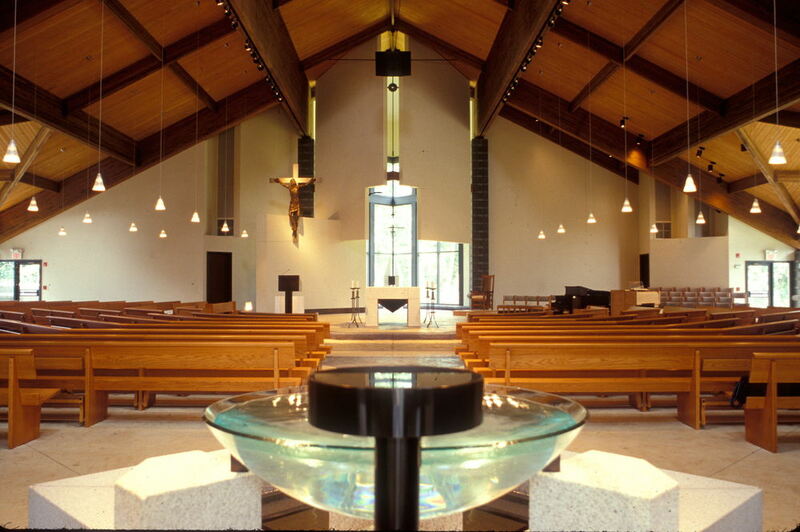 The east-west axial processional and recessional routes are reinforced by roof and ceiling construction where a baptistery space focuses attention from the font towards the sanctuary platform containing the ambo and altar. 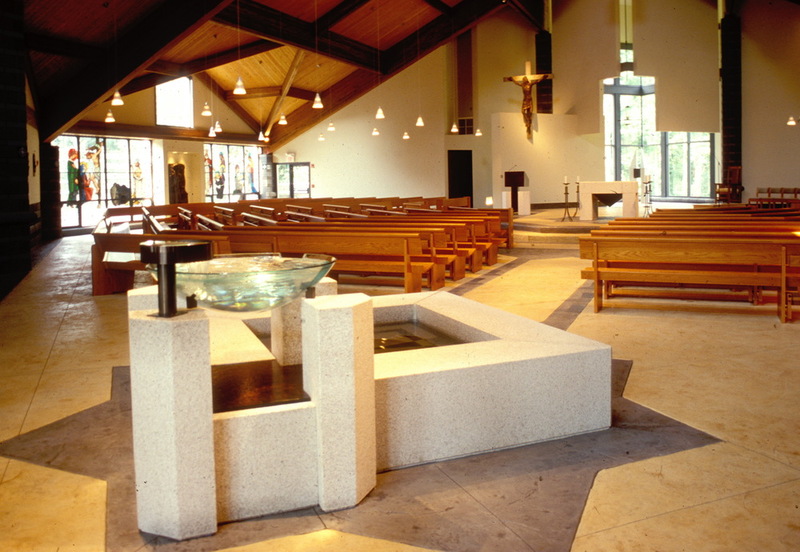 In accordance with the wishes of the local Ordinary, this axis is reversed at the glazed Blessed Sacrament chapel, both separate and part of the whole worship space. The major transcepts along the north-south cross axis also accommodate the stained glass narratives of the existing church. These Gospel narratives are set into a new translucent background of alternating courses of heavy seeded and remy glass that emulate the surrounding masonry patterns. As the Gospel is preached and real Presence actively dwells in this place, the financial realities and spirit of this community demanded that we employ authentic and noble materials in meaningful and practical ways. The materials that support the roof constitute the finished ceiling. The concrete block masonry used to hold up the roof supports finish the interior surfaces and mark the twelve anointed places of consecration. Other enclosing curtain walls, which simply bear their own weight, are lightly constructed of durable materials. The finished floor is a concrete slab, poured in textures and colors borne of the nature of the material. The stone for the cultic furnishings are solid granite; the wood for the other furnishings, solid oak. Nothing faux is tolerated, nothing is hidden.